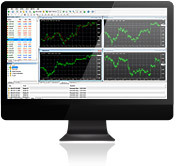 MT4 is highly regarded for a wide ranging functionality which accommodates the demands of all traders and their personal trading strategies. Open a Demo Account on our MetaTrader 4 Platform or get more details on our Downloadable Platform and Standard CFD or Forex Only Accounts. Browser requirements: - Internet Explorer version 7.0 / Mozilla Firefox 2.0 or the latest release of the browsers. Version International Markets is an introducer appointed representative of One Financial Markets with firm reference number 672736. Your account is held with One Financial Markets and all dealing, administration and settlement is carried out by them.